I was first introduced to yoga over 30 years ago and as the time has gone by it has become a more and more important part of my life. I graduated from Southampton University in 1982 with an honours degree in Physiology and Biochemistry and shortly after qualified as a Science Teacher. I married and had two daughters during the late 80’s and it was during this time that I began to share my love of yoga, I began teaching and embarked on a British Wheel of Yoga teacher training course, which I completed at the end of 1994. After a year or two of teaching yoga I noticed a need for yoga in pregnancy and, having experienced the benefits during my own pregnancies, decided to train and completed the Yoga for Pregnancy course with the Yoga Biomedical Trust in December 1996. The huge demand and enjoyment of Yoga for Pregnancy has led to interest from mothers for Post-Natal Yoga. I am one of the first teachers in the country to receive a Diploma from ‘Birthlight’ in Baby Yoga and I run very popular courses in ‘Mother with Baby Yoga’. In September 2009 I received my certificate from the BWY to enable me to train yoga teachers – I will be running a Teacher Training Diploma Course with my colleague Michael Huchinson in April 2011. My full time work is running yoga classes in North East Hampshire. I enjoy training and updating my skills for the benefit of my students. Yoga continues to develop in my life. 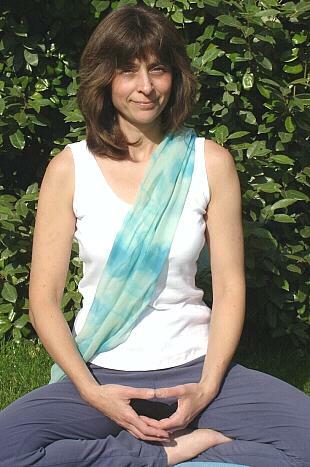 Copyright © 1995 to date Fiona Wells, Fiona Wells Yoga, all rights reserved.